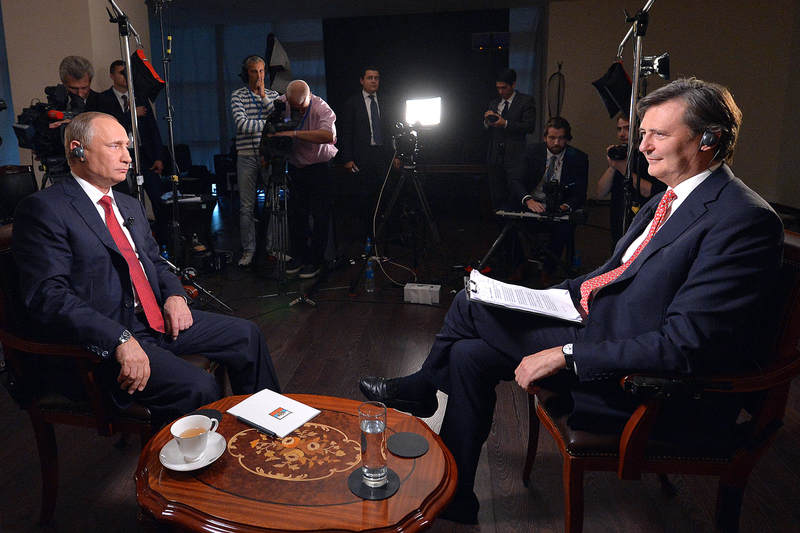 Russian President Vladimir Putin (left) and chief editor of the Bloomberg John Mikletveyt during an interview with an international news agency "Bloomberg" on the island of Russian in Vladivostok, Russia. On Sept. 2, at the Eastern Economic Forum in Vladivostok, Vladimir Putin gave an interview to the Bloomberg international news agency. The Russian leader spoke about his readiness to renew dialogue with Japan on the Kuril Islands, about the agreement with the U.S. on Syria and about Russian hackers. RBTH presents the seven key points of Putin’s interview. "I don’t know anything about it, and on a state level Russia has never done this," Putin said, denying the accusations that Russia had broken into the U.S. Democratic Party servers. "Is it really important who broke into the data of Mrs. Clinton's election headquarters? Is it really important? What's important is the content that was presented to society," Putin said. 2. Relations between Russia and the UK depend on the U.S.
"The UK’s relations with Russia depend not on its presence or absence from the EU, but on its special relationship with the U.S.," said Putin. Relations between Russia and the UK, which in Putin's view have not been very positive lately, may improve if London assumes what he described as a more independent foreign policy. Russia keeps 40 percent of its foreign exchange reserves in the euro, which is why, despite the existing political disagreements, stability in the eurozone is important for Moscow, remarked the president. "There could be some decisions made that would consolidate a group of countries with equal levels of development and, thereby, in my opinion, strengthen the euro,” he said. "I don’t rule out that we’ll be able to agree on something in the near future and present our agreements to the international community," said Putin. For progress to be made it is important to draw a clear line between the moderate opposition and the terrorists, he insisted, saying that the issue has been unresolved since the beginning of the negotiation process. Putin said that Russia and China have switched to a completely different level of cooperation. He listed the new spheres of joint activity: space programs, machine construction, high-speed railway communication, the construction of nuclear power plants in Tianwan, etc. "We do not trade in territories, but the problem of concluding a peaceful agreement with Japan is, of course, crucial and we would really like to find a solution with our Japanese friends on this issue," said Putin. Russia is ready to renew the dialogue that was frozen several years ago on Japan's initiative, he continued. However, this does not imply trading in territories. The sides must search for a compromise that would suit them both. Russia supports the idea of stabilizing oil prices by freezing production levels and has not changed its position, emphasized Putin. Stabilizing prices has been impossible due to the policies of other oil producing countries, in particular Saudi Arabia. In Putin's view, the best policy for oil producing countries would look like this: freezing production on a certain level, with some exceptions for Iran, which entered the market just recently after Western sanctions were lifted. "Iran is starting from a very low position, linked to the well-known sanctions in relation to this country," said Putin. "It would be unfair to leave it on this sanctioned level."